California owes more than it owns. California is a Sinkhole State without enough assets to cover its debt. 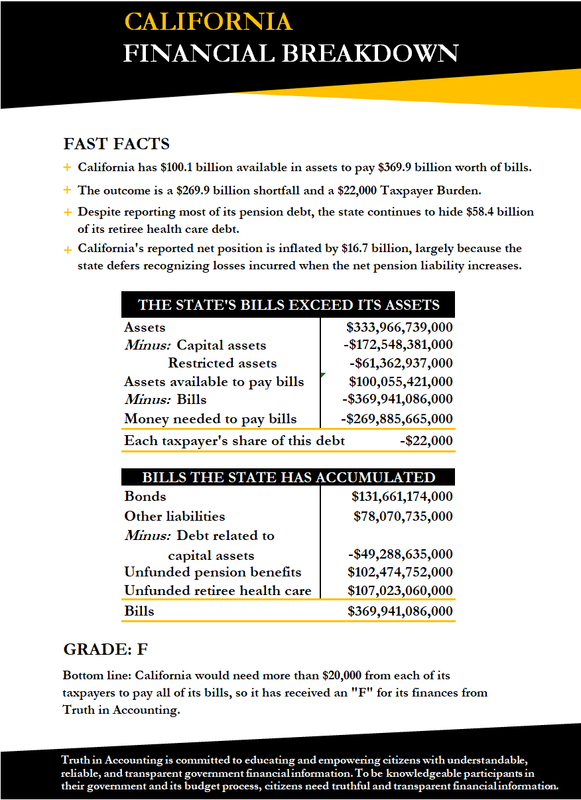 California only has $100.1 billion of assets available to pay bills totaling $369.9 billion. Because California doesn't have enough money to pay its bills, it has a $269.9 billion financial hole. 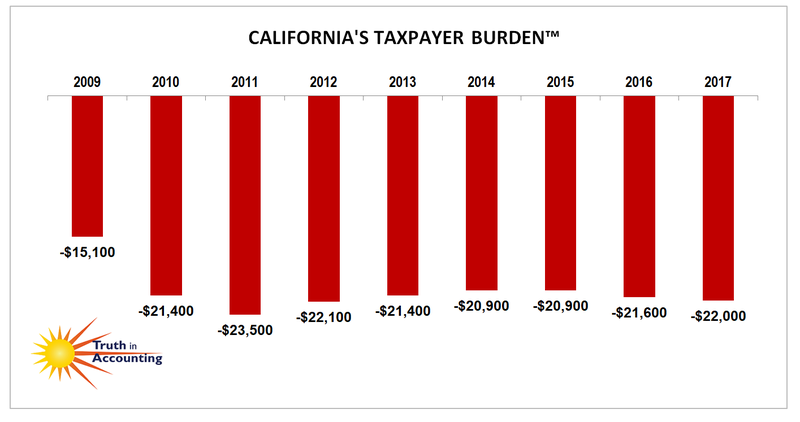 To fill it, each California taxpayer would have to send $22,000 to the state. California's reported net position is inflated by $16.7 billion, largely because the state defers recognizing losses incurred when the net pension liability increases. Despite a recently implemented accounting standard meant to increase transparency, California still excludes $5.4 billion of pension debt from its balance sheet. In addition, the state is still hiding $58.4 billion of its retiree health care debt. A new accounting standard will be implemented in the 2018 fiscal year which will require states to report this debt on the balance sheet. The state's financial report was released 264 days after its fiscal year end, which is considered untimely according to the 180 day standard. It’s happening again. 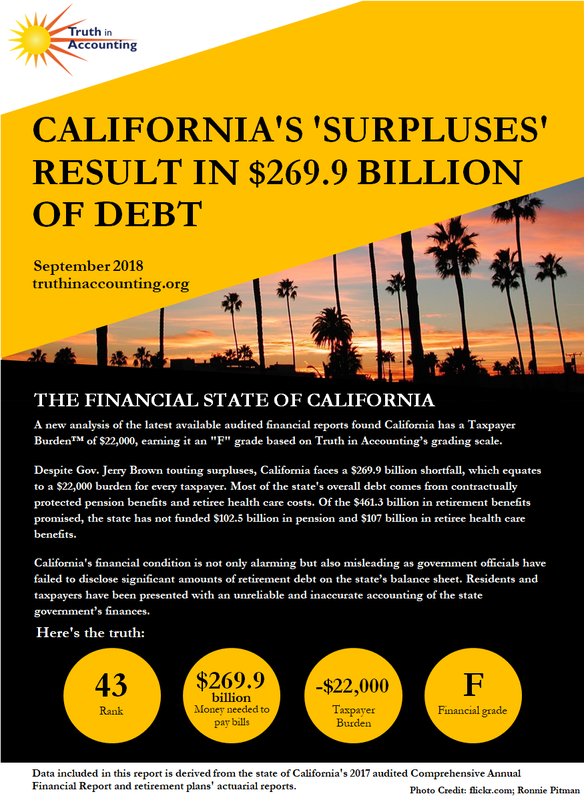 People who should know better are pointing to California’s current budget surplus as proof that the state, the world’s fifth largest economy, is in sound financial shape.